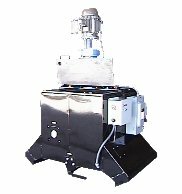 Double boiler design provides even, low density heating. Electrically heated oil jacket allows compound to run at any level, even empty, without damage to tank. Indirect heat eliminates danger of fire or burning due to exposed heating surfaces. NEMA 1 construction for single phase units. NEMA 12 combination disconnect with 110 volt control circuit power for three phase units. Oil jacket heated with either NEMA 4X immersion heaters or NEMA 1 strip heaters. Digital indicating temperature controller with type J thermocouple standard on all three phase units. Bulb and capillary thermostat with thermometer standard on singlephase units. Optional NEMA 7 construction available. Standard construction of compound tank is mild steel, 10 gauge thick, with all liquid bearing seams double welded inside out, and leak checked after each welding pass. Oil jacket constructed of 10 gauge mild steel and pressure leak tested. Optional type 304 stainless steel construction available. Three inches of insulation on the bottom and three sides. Insulated lid with fusible safety closure. Outer shell constructed of 16 gauge mild steel and finished in Polane® polyurethane enamel. Full length stainless steel hinge on lid. Optional paddle style mixer is center mounted in circular tank and complete with all controls including a reverse acting thermostat to prevent operation before compound is melted. Available with fixed or variable speed operation. Optional 7 day timer and high temperature cutoff with manual reset and optional alarm available. Optional circulating pumps and filter are available for a wide variety of applications. Optional pneumatically operated lid. DOUBLE BOILER DESIGN uses a double walled and jacketed tank. The oil in the surrounding jacket is heated which then heats the material. Provides a low watt density heating for melting even the most difficult compounds. RUNS AT ANY LEVEL without damaging the heating elements or overheating the compound. Since the oil jacket is heated, the tank can even be run dry without damage or risk of fire. DIGITAL TEMPERATURE CONTROLLER with type J thermocouple and digital readout of the compound chamber standard on all three phase units. Helps provide tight temperature control and accurate readout of compound temperature. FUSIBLE SAFETY CLOSURE closes lid automatically in the event of fire when used with combustible compounds. Standard UL approved 368 degree Fahrenheit fuse link. Other ranges available. HEAVY DUTY CONSTRUCTION features 10 gauge minimum inner tank construction with all seams electrically welded and structural frame supports integral to machine. CUSTOM SIZES AND APPLICATIONS with heated, temperature controlled and insulated delivery systems designed for your application. Tank sizes to meet virtually any need.